Comparing cardboard boxes for moving is quite tricky. Although both shipping and moving boxes have the same quality and weight, you will need thicker cardboard for storing heavier items. Planning your next big move will involve buying boxes for your items. It might be tempting to use the old boxes from grocery stores, but there is no guarantee that your items will be delivered to your new home damage free. Cost is a number one concern for customers. This is why people jump at every opportunity to save money. However, if you are going to look at the bigger picture, you will realise that when it comes to choosing packaging materials, quality must be a top priority. Regardless of your moving needs, always keep your fragile items in mind. One thing you need to remember is the type of boxes you need. If there is one rule you should live by, it is avoiding overpacking moving boxes. Even hired movers discourage overpacking and will recommend you to keep boxes to a minimum. Boxes come in different sizes. Some measure 16 x 12 1/2 x 12 1/2 inches while others can be as large as 24 x 18 x 24. These boxes have different uses. Small boxes are great for dishes, lamps, books and more. Large boxes are perfect for computers, blankets, comforters, and cushions. Not all movers offer this type of box. More often than not, movers use plastic bags to cover your mattresses. They are cheaper to purchase. However, the mattress can get punctured or damaged by outside elements. This is why moving companies consider keeping your mattress in a box as a better option. Mattress boxes come in various sizes depending on the size of your bed. The size of mirror boxes may vary, but these boxes are usually put together to fit a long mirror. The boxes are then secured with a strong filament tape. Mirror boxes are best for framed pictures, mirrors and artwork. You will also need to purchase bubble wrap for framed items. One of the important cardboard boxes for moving you should not forget is the wardrobe box. It comes in different sizes (small, medium, large). If you cannot pack closet items flat, wardrobe boxes will do the trick. These boxes are also used for delicate wind chimes and chandeliers. If you have wine bottles, cups or glasses, use dish packs to store them. Make sure you do not overpack them as they can result in shattered items. You will also have to check the weight to ensure that items are manageable. 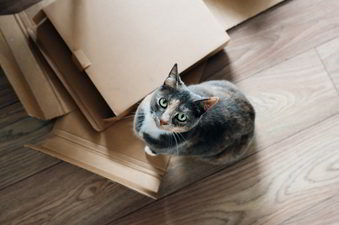 Always take time to research on the type of cardboard boxes for moving. They are made from various materials and if you go for recycled boxes, you might just do more harm than good to your items. You can also read tips on best place to buy moving boxes so you can get great value for money without compromising on quality.